BMW's long-awaited electric vehicle, the i3, always promised much. Now, it delivers even more. Jonathan Crouch reports. BMW i3 has proved to be a successful first stab at the all-electric vehicle market for its Munich maker and since the original 2013 launch, the Munich maker hasn't stopped trying to improve it. In 2016, the original 60Ah version was replaced with a 94Ah variant that boosted this model's all-electric operating range to over 200 miles. A year later, BMW gave the styling a minor refresh and added a slightly pokier i3s derivative into the range to create the model line-up we're going to look at here. For all buyers, the option remains on both variants to add in a small 'Range Extender' petrol engine to further boost operating mileage. The result of all these improvements is a car that's now even harder to ignore in this growing segment. If you're of the old school and BMW means shark nosed, six-cylinder, ultimate driving machines to you, the Munich company's i3 electric vehicle is going to appear a wholly alien concept. It's a squat little citycar riding on 155mm wide tyres. Yet delve a little deeper and it doesn't take long to find a strand of proper BMW DNA. It's revealed in the thinking behind the engineering and the logic that went into making the various development decisions. Wherever BMW's engineers could have developed a more focused, technically correct solution, they appear to have done so, allowing for certain cost controls of course. Of course, you might well be part of the 99% of British car buying customers that chooses an internal combustion engine over an electric motor. Your next car and maybe the next one after that will probably be powered by fossil fuels. Even if that is the case, have a look at what the BMW i3 now offers, especially in this improved form with its long 205-mile all-electric operating range. It's building a case for electric vehicles that is becoming ever more convincing. Think of the i3 as a car in two halves. The bottom half is almost all aluminium, the upper half almost all carbon fibre. Armed with this information, you can rightly surmise that it doesn't weigh very much. Even with the weight of all those batteries - some 230kg comprised of 96 individual cells kept at an optimum 20deg Centigrade by their own air conditioning unit - the i3 only tips the scales at 1,195kg. Compare that to the 1,395kg of the entry-level petrol-powered Mercedes-Benz B Class and you'll appreciate the lengths BMW have gone to keep weight low and efficiency high. The styling is determinedly modern, with the kidney grille being the key BMW styling signature. The black hood, roof and glazed hatch will be characteristic features for future BMW 'i' cars. Adaptive LEDs headlights and floating LED tail lights are standard. The lowered belt line in the rear and absence of a "B" pillar improves visibility, while the rear "coach" doors make entry easier. As for changes made to this revised model, well there aren't many. The trademark BMW i Black Belt running from the bonnet over the roof to the car's rear end is now complemented by A-pillars and roof lines that also sport a black finish. The front and rear aprons have been restyled and a smart chrome design strip now runs across the full width of the rear end. On the sporty i3s variant, there's a roof line accent with a high-gloss black finish and a rear apron composed of individually styled contours with a black surround frame featuring an extra-wide, body-coloured inlay. As before, the i3 really isn't a very big car, measuring just 3,999mm long, which is only a tad longer than a Ford Fiesta. Despite that, thanks to the flat floor, the thin seats and the low window line, the cabin feels surprisingly roomy. The instrument cluster and Control Display comprise two screens, one behind the steering wheel and the other at the top of the centre console. Interior materials are eco-orientated, with the dashboard and door cards made from dried grass fibres from the kenaf plant and eucalyptus wood being optional. The boot measures 260-litres, but fold the rear seats and you get up to 1,100-litres. Expect that capacity to drop if you choose the range-extender motor. This is a modified version of the 650cc two-cylinder petrol engine used in the company's CT650 GT maxi-scooter, with a nine-litre fuel tank ahead of the front seats. Value. That's a really tough one to assess in the context of the i3. Prices start at around £34,000 for the standard all-electric model, which sounds quite a lot until you remember that this car qualifies for a generous £4,500 government-funded Plug-in car grant. That takes the asking figure down to just under £30,000, a sum you could easily pay for a pokey diesel version of a similarly-sized premium badged model like an Audi A3 or a Mercedes A-Class. There's a £3,000 premium to pay if you want the sportier 'i3s' variant. And, whether you choose the standard model or the i3s, your dealer will offer you the option of adding in that little 'Range Exender' petrol engine for just over £3,000 more. 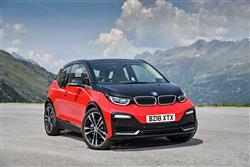 Go for an i3s with the Range Extender fitted and even after the deduction of the government grant, you'll be looking at needing to shell out around £37,000. The i3 represents the first time carbon-fibre reinforced plastics (CFRP) have been used in a mass-production electric car. Combined with injected thermoplastics, the i3's body will never rust and will be largely dent resistant. Can an i3 really make economic sense? It's tempting to conclude that for a typical buyer covering, say, 7,500 miles a year, simply opting for a cheap citycar with a 1.0-litre engine would be a better bet. However, factor in something like the London congestion charge, which could run you over £8,000 for that period, couple it with the minimal fuel bills and likely strong residual values of the i3 and the BMW comes into its own. Put it up against conventional diesel versions of premium rivals like the Audi A1 and the Mercedes-Benz A-Class and they don't enjoy a massive price advantage, thus making the i3 look increasingly attractive. This car's certainly widened its market scope since BMW gave it an uprated 94Ah powertrain, which on the full-battery-powered model has facilitated an increase in all-electric NEDC driving range from the 112 mile total on offer when this car was originally launched to as much as 205 miles in its current form - quite a change. The 'Range Extended' versions offer a slightly lower all-electric NEDC-rated driving range (up to 146 miles on the standard model and up to 121 miles with the i3s) but of curse, when that expires, you've the advantage of knowing that a frugal little petrol engine will cut in, exending your driving range to as much as 276 miles. The figures just quoted are all European test cycle stats of course: in real world use, we'd probably expect around 120 miles in regular use from the standard all-battery model - maybe 150 miles if you're a feather-foot. Go for the standard 'Range Extender' derivative and of course you can raise that figure substantially - to well over 200 miles. Recharging times vary, but are much quicker, despite the significantly larger battery capacity. A DC Rapid-charge system is now standard and AC charging is now multi-phase, meaning full charging can be completed in under 3 hours with the multi-phase system. As before, the car can also be charged at home using a standard three-pin plug or by specifying a BMW i Wallbox. We said electric cars were going to get better: here's a great example of just how. BMW's i3 was already a very good product. Now, it makes more sense than ever. As before, this model is unashamedly high-end - you only need to look at the materials it's built from to appreciate that - but as a result, it's leagues more exotic than a conventionally-powered rival with a premium badge. Indeed, its carbon fibre and aluminium construction lends it a technical sheen of cool that's quite different to the usual electric vehicle proposition, which all too often gives off the distinctive whiff of anorak. Costing around £2 to charge, with a real world range of up to around 150 miles on batteries alone, the i3 will work for many suburban commuters looking for something stylish and a bit different to the norm. One day electric vehicles will be cool rather than nerdy and if that happens, we think the i3 will be seen to be the car that started that progression.